Federal-Mogul Powertrain, a division of Federal-Mogul Holdings Corporation, has developed a first in piston cooling technology by creating a sealed-for-life coolant chamber within the crown of its market-leading Monosteel heavy-duty diesel piston. Delivering superior cooling efficiency with minimum weight, EnviroKool is the latest evolution of Federal-Mogul Powertrain’s proven Monosteel technology. An integral cooling gallery is created within a steel piston using friction-welded construction and then filled during the manufacturing process with a high temperature oil and an inert gas, before being permanently sealed with a welded plug. 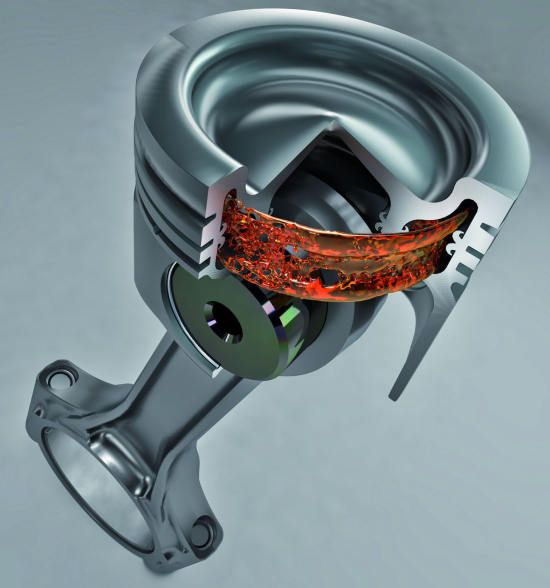 The EnviroKool technology has enabled Federal-Mogul Powertrain to overcome the temperature limitations of conventional open galleries that have to use engine lubricating oil as the heat transfer medium.The prolonged exposure of engine oil to higher temperatures in the piston oil cooling gallery leads to degradation and carbon build-up, reducing the cooling efficiency and leading to overheating. The superior high temperature properties of the EnviroKool gallery coolant allow it to handle increased gallery temperatures reliably, with the heat subsequently removed from the undercrown—where temperatures are lower—by a standard cooling oil jet.With no build-up of carbon in the cooling gallery, heat dissipation remains unhindered for the life of the piston. The new technology is so effective that the oil cooling flow to the spray jets can be cut by 50%, reducing work for the oil pump, lessening parasitic losses and improving engine efficiency, the company said. The heat removed from the piston as a result of the spray jets is additional to that which is conducted away through the pin, piston skirt and ring pack.